According to a recent article from the Associated Press, Iowa’s nursing shortage, which spans across multiple nursing categories, has reached an alarming stage. Many nursing leaders have beefed up their efforts to provide better training programs to help prepare for a growing number of vacancies in the upcoming decade, as well as encourage current and prospective nurses to stay in the profession long-term. If you’re considering the practical nursing field and are interested in opportunities in Iowa, keep reading to search LPN programs, learn about state licensing requirements, and get salary and employment information. There is no getting around the licensure process if one wishes to practice and find employment as a practical nurse in Iowa. One crucial requirement for licensure is completion of state-approved postsecondary nursing education, either in the form of a diploma, certificate, or associate degree. 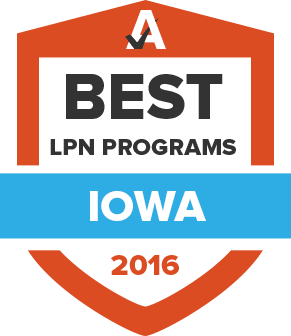 Accredited LPN programs in Iowa offer quality education and training to prepare its graduates for employment within state borders. Use the search tool below to filter for and compare available academic options across the state. There’s no getting around it – Iowa state licensure is an absolute must for LPN practice within the state, and responsibility for meeting all licensing requirements rests solely with the nurse. Below is a description of those requirements and what an applicant must do to meet them. Report any past felony convictions or record of prior disciplinary action against you, regardless of jurisdiction. These must be reviewed and approved by the Iowa Board of Nursing prior to license issuance. The Iowa Board of Nursing is responsible for the approval of all LPN programs with a physical presence in the state. The Iowa Board of Nursing does not approve out-of-state programs, but will accept an applicant for initial licensure/endorsement who has graduated from an approved out-of-state program. The majority of LPN programs in Iowa can be found at community colleges throughout the state. Most of these programs can be completed in two semesters of full-time study, culminating in the award of a certificate. Some programs can lead to an associate of applied science degree (AAS), but this option usually takes two years. Must submit an official transcript from his or her nursing program denoting the degree awarded and date of graduation directly to the Board. Only mailed hard copies will be accepted. License renewal can be done online through IBON Online Services and include a $99 fee. Expiration dates are indicated on each wallet card, but can also be viewed online through the Online Verification System. LPNs can renew their license up to 60 days before the expiration date, and Iowa law requires that it be renewed no later than 30 days prior to expiration. There is no monetary penalty for missing this cut off; however, it is not guaranteed that the new license will arrive before the old one expires. Paper renewals that are returned to the applicant for any reason and then resubmitted after the 15th of the applicant’s birth month are considered late renewal and are subject to a $50 late fee. The state does not prohibit the practice of practical nurses who are waiting for a new licensure during the 30-day grace period. Employers, however, can prohibit practice. Additionally, LPNs must complete a continuing education requirement for license renewal. The first renewal requires 2.4 Continuing Education Units or 24 Contact Hours for renewal. Subsequent renewals require 3.6 CEUs or 36 Contact Hours. Iowa is a state whose population is spread throughout a number of modest-sized cities including Des Moines, Cedar Rapids and Davenport, as well as small rural communities and farms. Check the tables below for more detailed information on LPN salaries in Iowa. According to the Iowa Center for Nursing Workforce, Iowa has a ratio of three LPNs per 1000 residents, substantially higher than the national average of two LPNs per 1000 residents. Below is a look at some helpful employment statistics and trends for Iowa LPN job seekers. This is the state website for the Campaign for Action, a non-profit organization sponsored by the Robert Wood Johnson Foundation and the American Association of Retired Persons (AARP). The Campaign's goal is to promote the implementation of recommendations in the Institute of Medicine's report, The Future of Nursing: Leading Change, Advancing Health. Website provides information on association membership, policy and procedures, and the association's annual convention. The association is a chapter of the National Student Nurses Association. The Iowa Board of Nursing oversees all aspects of education and licensing of nurses in the state. Its mission is to protect public health, safety and welfare by regulating the licensure and practice of nurses, and through nursing education and continuing education. Website offers useful information on education throughout the state, including info on community colleges, career planning, and veterans and military education. Government website with information regarding all aspects of public health in the state. Excellent source for Iowa health news and links to other state resources. The Iowa Hospital Association is an organization that represents and supports Iowa hospitals in achieving their missions and goals. Their website offers links to a wealth of nursing and health-related resources. The INA is the professional association of registered nurses in Iowa. INA provides excellent information on a variety of LPN subjects including nursing careers, continuing education and public policy. The IONL's mission is to, "represent and support nurse leaders in the state of Iowa as catalysts for innovation." Its board consists of executives from leading hospitals and medical centers throughout the state. The NCSBN is a not-for-profit organization whose members include the boards of nursing for all 50 states, Washington D.C. and four U.S. Territories. The NCSBN provides education, service and research to promote regulatory excellence in patient safety and public protection. Headquartered in Iowa City, the Visiting Nurse Association is a non-profit organization that provides medical services to individuals with acute or chronic illness or disability throughout Johnson County.